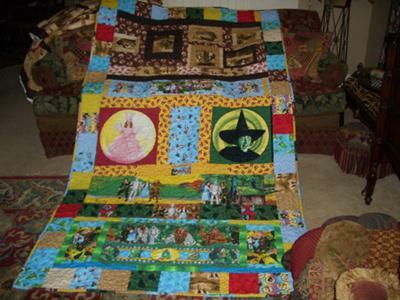 After finishing the last in my series of Wizard of OZ quilts I wanted to use up as many of my scraps as I could. My niece Heather Ann is very special to me and when she saw the other quilts she said that was her "Favorite Movie of all time". Since that was a surprise to me I dedicated more cutting and piecing to her. Using leftovers from all 4 series I combined them into one quilt telling the story from the top of the quilt to the bottom. Enjoy!! She loves it and I am always picturing her wrapped up in it. She cried when I gave it to her as a surprise. Lots of love goes into every quilt I make. I love this quilt do you make them to sell?